When you’re searching for quality torque converters for your high performance street car or truck, we have the best designed and built options anywhere. 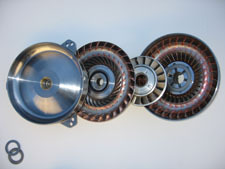 Our performance torque converters fit popular transmissions such as the 350, 400, 2004R, 700R4, 4L60, C-4, C-6, Aod 4R70W & E40D. 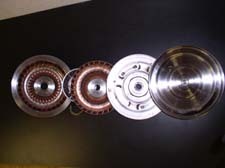 You can custom order your torque converter stall to match your vehicle’s set up. Choosing the right type of street performance torque converter can be a compromise but the wrong torque converter can destroy or shorten the life of your performance engine. You want to make sure and choose converters based on (RPM) levels where engines use most of their torque. Most street performance engines run on low RPM’s so choosing a street converter that works at low RPM’s will be the perfect match. 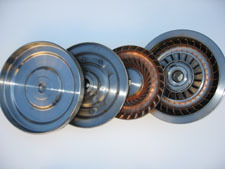 For more information about choosing the right type of torque converter for your vehicle, Click here to view some basic guidelines that can help you find the right torque converter for your specific application. Handles up to 500 H.P. Handles up to 750 H.P. 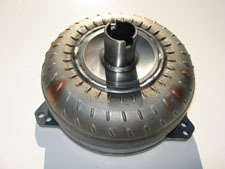 This is a 10 inch lock-up 700R4 torque converter which also works for the 4L60 transmission. The stall range can be set from 2800 to 4500 based on your needs. Dual bolt pattern to fit small block and big block applications. Internal parts are brazed for strength with enclosed Torrington bearings. 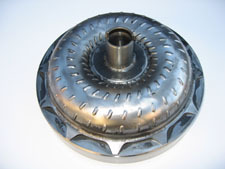 This is a 10 inch converter for Turbo 350 and Turbo 400 transmissions. The stall range can be set from 2800 to 4500 based on your needs. Billet steel front cover features dual bolt pattern for small block or big block engines. Fully brazed internal fins flanged process 90 pump HUB with balloon plate.